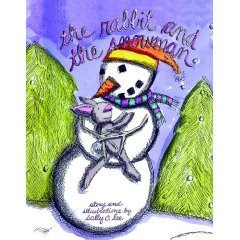 This is a cute story about a snowman who after being built, is abandoned by the children who made him. He is lonely until he meets a rabbit. They are friends for a while until spring comes and the rabbit is left alone. Then Spring, Summer and Fall pass and it’s Winter again and lo and behold there is the snowman again. It’s a cute story that sort of illustrates that friends come and go but that doesn’t mean they don’t still like/love us when they are gone. The illustrations are cute, hand-drawn outlines with water-colours to add colour to the illustrations. The text in the book is an unusual font and instead of being one font size, it changes according to how much text is on a page. It ranges from 9 to 68 words a page. If you are reading the story to your child this won’t matter but the book is not designed well for a child to try and read it himself.